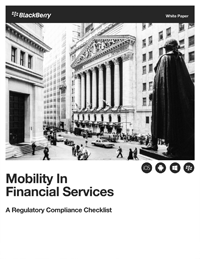 Like business leaders in every industry, decision makers in Financial Services (FS) organizations are increasingly turning to mobility to deliver on strategic objectives. They understand that mobilizing business processes can help improve customer satisfaction and response times; boost employee productivity; increase competitive advantage, and much more. Most CIOs in these industries want nothing more than to help their line-of-business colleagues uncover new opportunities for growth.